Kuurne-Brussels-Kuurne used to be the ‘revenge match’ for Gent-Gent (Het Nieuwsblad); after poor showings in Saturday’s race, QuickStep usually rode on Sunday with great panache to salvage the weekend — they did this with Nuyens in ’06, Boonen in ’07 & ’09 and brilliantly with de Jongh in ’08. Riders who had been sitting pretty waiting for the sprint realised that they had to chase hard — but it was too late. It was the classic double bluff swerve by Lefevre, turning the situation around in a blink. Bobby Traksel features on the posters this year. And finished a respectable 13th this year. A number of factors have to be considered, the weather was kind — cold but calm with no killer crosswinds or rain; but another factor is that so many riders are coming in to the race in great condition and there’s little to choose between them. Many of the riders have ridden the Tour Down Under, San Luis, Oman, Qatar or Langkawi; and the early races in Europe are no longer ‘training’ they’re full on, brutal. Kristian House told me recently that he started his season with 7,500 kilometres in his legs — and that’s for a largely domestic UK programme. Maybe the organisers at Kuurne have to change the parcours? Lose one — or both — of the finishing circuits, keep the riders out on the cobbles and bergs for longer and shorten the run-in? We joined the An Post convoy to the start. Russ Downing was 18th yesterday in Het Niuewsblad. 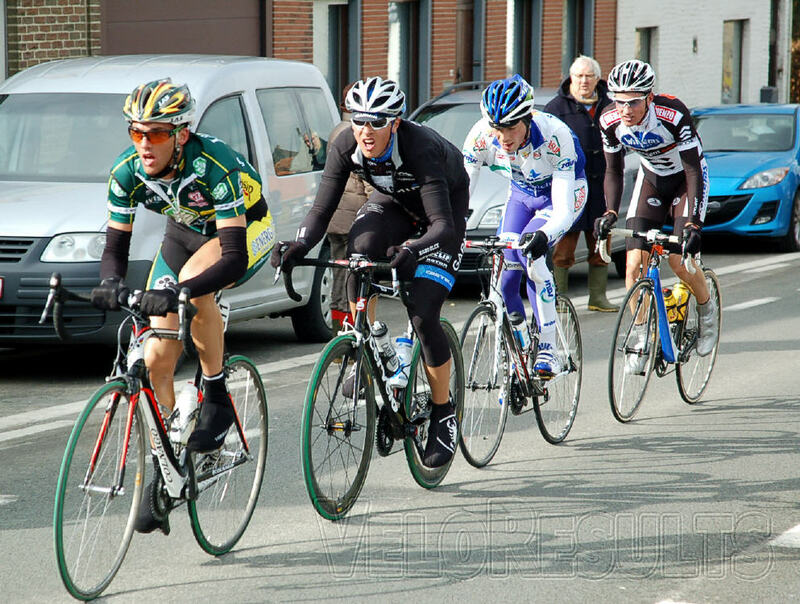 We had more time to ‘bike skek’ at Kuurne but it took us a while to get our bearings, the wee teams all used to park up at the football pitches whilst the ‘big guns’ were in a compound near the start. This year however, there were few teams at the football pitches and the compound was being used for a gymkhana — the team buses were all parked up on the main road instead; but by the time we sussed that out the start was approaching. Ed and Callum pose beside a big beer – not for the first time this weekend. VR pal John Young and his monopod. We caught up with Hamish Haynes, looking good in his new Colba-Mercury team strip — he’s put in a mega winter and we’ll be keeping a close eye on the results for him. James Spragg was looking good too, his QIN team has morphed into Donckers Koffie; the QIN jersey was a bit ‘different’ and almost worked, but this year’s jersey is cool, if conventional. The budget at Donckers is good, with a nice bus and some strong riders — Kevin Hulsmans, Kurt Hovelynck, Huub Duyn and Tom Stubbe. Kuurne still has that ‘race of the people’ feel with little police control or corporate schmooze-type-goings-on and a generally laid back, friendly vibe — we like it. Rabobank DS Erik Dekker was relaxed and happy – ten wins by the end of February does that to a man. One of the many bookies. We caught the early break on the Edelare — which is just the drag out of Oudenaarde on the way to Brakel — and four were away but soon to be DQ-ed for ‘risking their lives’ at a level crossing. The general feeling is that the guys in the break were treated a bit harshly – the barriers at the level crossing hadn’t started to move when they went through. Once the break was removed, it was a full peloton which made it to the finish. Andy Fenn was giving the AN Post jersey a good airing between the break and bunch — our pal Viktor doesn’t like their Dolan bikes, but I do. The Oude Kwaremont was in bountiful mood for 2011, blue skies, little wind and dry cobbles — last year it was like standing at the gates of Hell. Irish Champ and new HTC recruit Matt Brammeier. Dan Fleeman and Sarah Reynolds were out on the course and came up to see us — the Lichfield man is looking good, lean and tanned. Dan Fleeman and Sarah Reynolds. When I texted him to tell him that, he replied that I looked fat and pale. Thanks Dan – but trouble is, he’s right. Sarah rode the Ladies’ Gent-Gent on Saturday and Dan competed in the Ster van Zwolle in Holland, both finishing in the bunch. Dan was happy with his ride having done a lot of work for his Raleigh team. Last year there was no point in doing the mad dash over to the top of the Cote de Trieu to see the race again, a fallen tree scuppered that; but this year it was business as usual and we walked briskly up ‘Tour of Flanders Street’ to the top of ‘Phil’s Hill’ as Dave Duffers always used to call it. The reason being that Aussie star Phil Anderson used to do his interval training on it — no wonder he was a beast. Most of the climbs we’re all familiar with are within a very small geographic area, rearing from various directions up the ridge near Oudenaarde — ‘The Flemish Ardennes,’ the problem is that the traffic chaos means it’s impossible to get quickly from one to the other. But with the Kwaremont and Trieu it’s perfectly feasible, even if you’re not a quick walker you’ll at least see them hurtle down back to the main road. After that it’s hard to catch the race, the organisers — at the behest of the police — have ‘stretched’ the course to make it difficult to ‘race hop’, so it’s best to retire to a bar to watch the finale on TV. Our fave watering hole is L’Escale in Ronse, two years ago we had Callum in there, he was horrified by the heavily pregnant young lady quaffing Krieks and chain smoking; ‘It’s Belgium, son.’ was our explanation. Peter van Petegem is working with Garmin, we understand that his hiring has much to do with the radio ban: he’s there to keep JV’s guys right on tricky parcours of the cobbled classics. All that remained was to meet up with Hamish at the team hotel near Waregem to hand over a parcel of gels, isotonic drink powder and a new pair of shoes. The pizzas were good in Waregem, and as we wandered back to the cars we were treated to a well dressed but highly inebriated — perhaps at ‘couldnae bite ‘is thumb’ level – Flemish gentleman lurching out of the back seat of a Mercedes and stumbling across the car park to jump into his beautiful silver Porsche coupe and driving off with a flourish. Belgians love donkeys – it’s a long story.